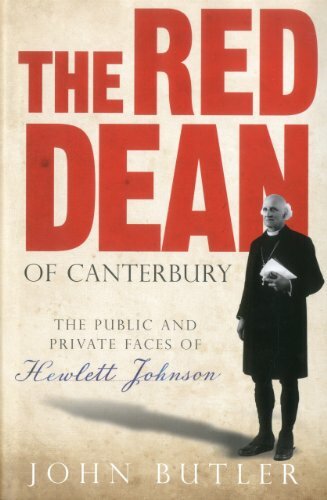 Hewlett Johnson, the Red Dean of Canterbury Cathedral from 1931 to 1963, was one of the most complex and intriguing public figures in 20th-century Britain. Converted to communism in the 1890s, he spent more than half a century as a priest in the Church of England. At the heart of Johnson s Christian faith was his unshakeable conviction that the principles of communism were all but indistinguishable from Jesus's teaching about the Kingdom of God on earth. For those who heard his sermons on Christianity and politics, Hewlett Johnson was either adored as a Christian visionary or hated as a mouthpiece of Soviet propaganda. There was little middle ground. Despised by the senior ranks of the Church of England, Hewlett Johnson was welcomed in high political places throughout the world. He had audiences with Stalin, Khrushchev, Molotov and Malenkov, Mao Tse-Tung and Chou En-Lai, Castro and Che Guevara. He also talked with Truman in the White House. He was tracked by MI5 for 35 years, was awarded the Soviet equivalent of the Nobel Peace Prize, twice spoke to huge audiences in Madison Square Garden, and was condemned by an Archbishop of Canterbury as blind, unreasonable and stupid . He was a prolific writer and a gifted orator, had two long marriages each of nearly 30 years, and became a father for the first time at the age of 66. This biography, which draws on his unpublished personal letters and papers, neither lauds nor condemns him, but re-examines his extraordinary life and career on the 80th anniversary of his appointment as Dean of Canterbury. John Butler is the author of the acclaimed 'The Quest for Becket's Bones' published by Yale. Published by Scala Arts Publishers Inc.